Specifically designed to heat quickly, this high-output pot cooker is a great choice when it comes to boiling, brewing, canning, or frying. 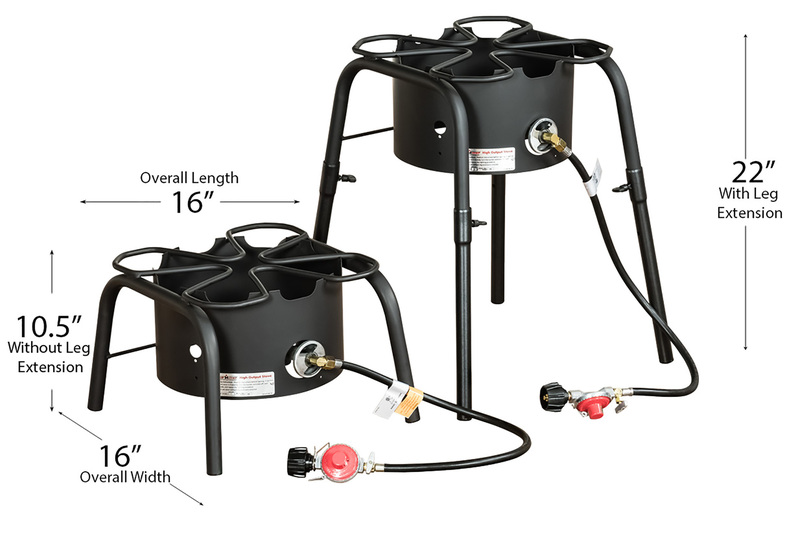 The high-pressure burner system makes this pot cooker a great addition to any outdoor kitchen. The small size and portability make this a great unit for camping and emergency preparedness. The sturdy, durable frame gives each chef the option to operate the unit on a table-top (10.5” tall) or have it free standing using the included leg extensions (22” tall). This 60,000 BTU high pressure unit will quickly boil water and get oil up to temperature to ensure you are cooking efficiently. 189 square inches of cooking space is plenty large enough to accommodate large pots and skillets. • Total weight of SH140L & 40 Quart Pot Set is 33 lbs. • Shipping weight is 33 lbs. • Ships via UPS Small Package. Need it fast? Select UPS Expedited Shipping at checkout.